Vanderbilt Industries lite blue is a 2 door web-based access control system with expansion capabilities to 8 devices. 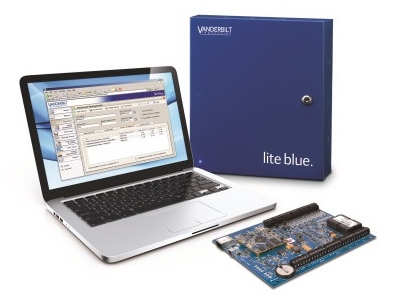 Designed in the same manner as Vanderbilt's flagship bright blue controller, utilizing embedded intelligence, lite blue does not require special software or a dedicated PC. This allows you the flexibility to manage your system from anywhere with internet access! lite blue takes simplicity a step further when it comes to cost effective, easy-to-use access control. Built on the Mercury platform, lite blue supports standard Wiegand devices, Schlage AD Series electronic locks, and various card formats and technologies such as proximity, smart card, magnetic stripe and Bluetooth. Add integrated video for a complete security solution! Vanderbilt Video Management packages are designed whereby each card swipe can be linked to video and easily retrieved during investigations. LITE BLUE. GREAT THINGS COME IN SMALL PACKAGES! The lite blue Controller from Vanderbilt Industries is a powerful web based controller for up to 8 doors/readers. Based on Authentic Mercury™ hardware, the on-board web server software allows administration from any network connected PC via your choice of internet web browser.